Did you spy Kevin Hart, Karen Gillan, the Rock, Al Pacino, or Karl Urban this month? Another jam-packed year of film and television production in Atlanta has come to a close. 2016 brought in billions in economic impact to the state, and if every indication we’re seeing holds true, next year should be even bigger. Right now, most productions are gearing down for the holiday break, but December has already delivered a slew of celebrity sightings, on-location filming, and those puzzling production codes you always wonder about. Here’s your early Christmas present—everything we saw filming this month, where we saw it, and which codes match which projects. After filming in Hawaii, Jumanji (production code: JAGUAR) set up shop in Atlanta at the end of November. The sequel to the 1995 classic brought Dwayne “The Rock” Johnson, Kevin Hart, Karen Gillan, Jack Black, and Nick Jonas into town. Production started December in the Gulch, shooting a market scene in the exact same location Captain America: Civil War did. On December 6, crews worked out of Westgate High School. The next day the production was spotted in Griffin. From the 9th onward, filming took place in the Sherwood Forest neighborhood in Midtown. Since we mentioned Civil War, it’s also important to note that Avengers: Infinity War (ML) is ramping up at Pinewood Atlanta Studios in Fayetteville. Don’t expect to run into filming just yet, but a drive near the studio may yield an ML sign or two. Grab your Eggos and string your Christmas lights across the wall because we’re smack dab in the middle of Stranger Things (BRIDE) season 2 filming. We saw the fan-favorite Netflix series all over the metro area last month, and December was no different. After shooting in Douglasville toward the end of November, filming moved to Candler Mansion on December 7. Two days later, a basecamp was spotted at Smoke Rise Baptist Church in Stone Mountain. 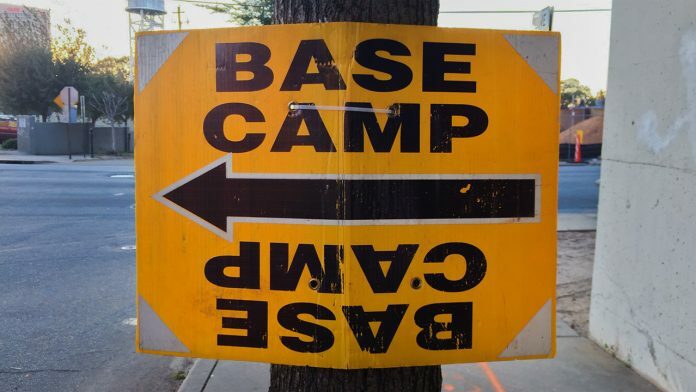 Since then, we’ve seen Stranger Things back in Douglasville, with a basecamp at Faith Evangelical Methodist. Just this week, Hangman (HANG) wrapped production. The film, which stars Al Pacino, Sarah Shahi, Karl Urban, and Brittany Snow, is about a detective and a criminal profiler working together to catch a serial killer whose crimes seem to be based on the Hangman word game. On November 18, we saw filming on St. Charles Avenue in Virginia-Highland. Just before December, production moved out to downtown Roswell. In one of the more bizarre set pieces one could come across, crews filmed a scene involving a body hanging from a tree in Buckhead on December 10. For the last bits of filming, we saw camerawork in Castleberry Hill on December 12, and in Fairlie Poplar on the 19th. BET’s The Quad (GAMU) is still working hard this December. On the December 3, GAMU signs were spotted on the Westside. On December 12, crews were back filming at Morehouse College, which is were most the series has been shot so far. We also came across a basecamp at Antioch East Baptist Church on the 19th. Jason Bateman’s Netflix series Ozark (BRYDE), which has seemingly been filming in the metro area for an eternity, was spotted at Chateau Elan Winery and Resort from November 30 through December 1. The next day, production moved to Holly Street, near Atlantic Station. On the 6th, we spotted a BRYDE sign on I-75’s exit 252A. FOX’s Star (SOS) shot at Northside Tavern on the 1st, then moved to Douglasville from the 12th to the 20th for scenes at the old prison. Sleepy Hollow (SH) was in Loganville on December 2, Conyers the following day, College Park on December 12, and back in Conyers for the 13th. MacGyver (EYE) filmed in downtown Atlanta on the 3rd, and we saw additional signs at Courtland Street and Andrew Young International Boulevard on December 7. Oprah’s Greenleaf (GL) series is back in town; signs were spotted off of Jimmy Carter Boulevard on December 12 and on Flat Shoals Road in Decatur on December 19. 24: Legacy (LEGACY) was at DeKalb Peachtree Airport on December 5 and on Tuxedo Road near Chastain Park on the 12th. Twin vampire shows The Vampire Diaries (LOC) and The Originals (TOGS) also were active this month. The former shot in Decatur on the December 9 through 12, while the latter filmed in Conyers on December 15 and 16. And since December is such a light month for film production, there’s not a whole lot of new industry news to share, but there are a few new trailers for various Atlanta-filmed projects, including Spider-Man: Homecoming, Stan Against Evil, and Hidden Figures. As for what’s in store for 2017? We’ll have Kevin Spacey in town for a new drama series, Manifesto. Another Marvel project, Black Panther, will begin shooting in January. Anna Kendrick and Elizabeth Banks will be here for Pitch Perfect 3 soon. You can also look forward to a Tonya Harding biopic, a Friday the 13th remake, and a Gerard Butler project, Den of Thieves. See you next year!